We are plowing through second grade with my oldest kiddo and this Money series was perfect timing for supplementing what she's learning at school. We've done a lot of second grade activities here based on what she's been doing at school. Today, we practiced counting coins and making change with a hands-on activity with a little pretend shopping. 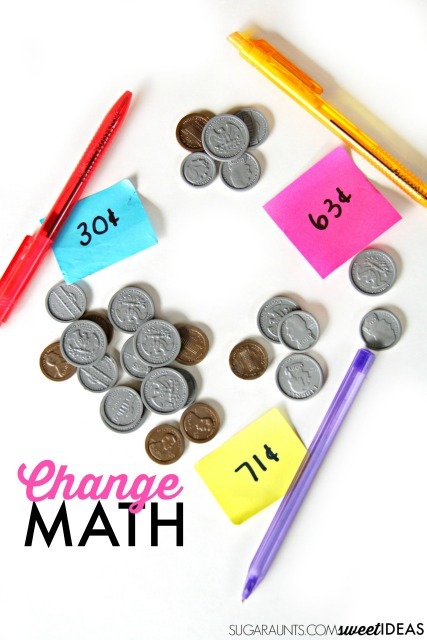 This was a fun way to practice counting money while working on fine motor skills, too. For this activity, we used our play money set. I love this set because it's loaded with coins and bills. 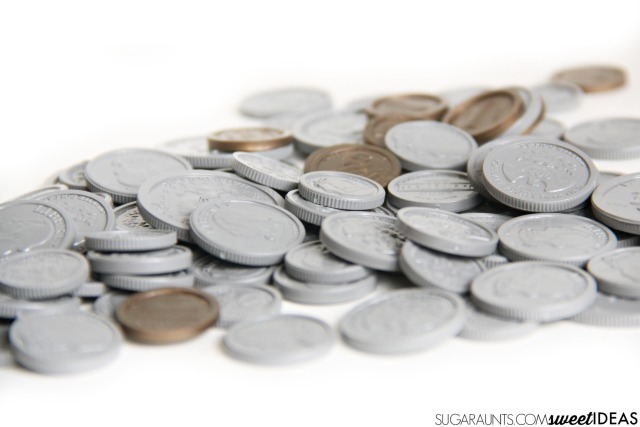 It's a great way to practice and learn money skills with hands-on learning. We started off by sorting out the coins (after a certain one year old dumped the whole set on the floor!) and it was a good warm up to name and practice counting coins as we put them back into the correct spots in the wooden storage box. Next, I found a few stacks of sticky notes and wrote some amounts. I varied the amounts from cents to several dollars. Then, I grabbed a handful of pens in different colors. This activity is very adaptable. 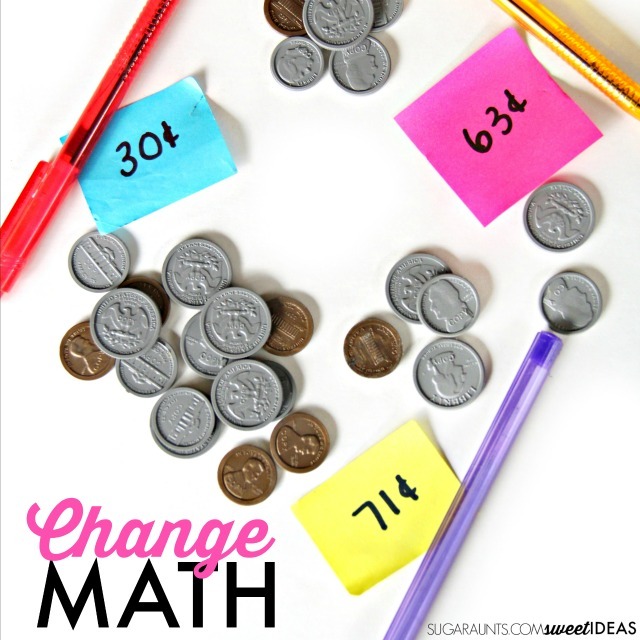 Use whatever you've got in the house, from pretend play food to real pantry items, you can use any item for counting money and change. Use items that keep your child interested. I matched up the items with different amounts written on the sticky notes. I had my daughter count out the coins, starting with the largest coin. I asked her to tell me the number of each coin needed to get the amount, using the least amount of coins. Next, I gave her a few play bills and a handful of coins. I placed the price tags on each pen and asked her to buy the pen she wanted. She chose a pen and then counted out the coins needed. Finally, we switched roles. I gave her a bigger amount and asked her to count change, starting with the price of the pen until she reached the bill or coin amount. We practiced this game over and over again and got some great hands-on money practice, all with "buying" pens! Using the play coins (and having a huge pile of money to "pay" with) really motivated her to keep practicing money counting. 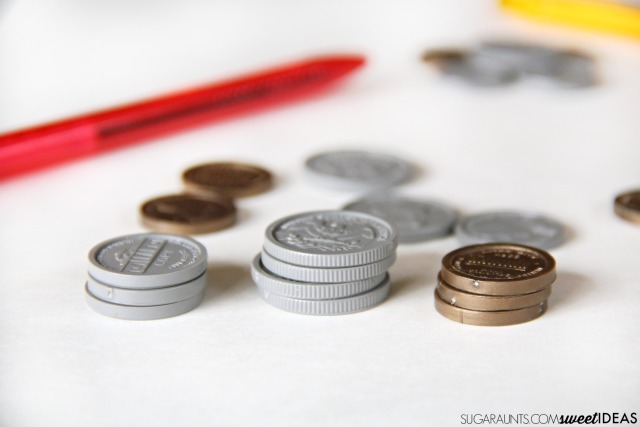 We've shared how to use coins in fine motor skills before. We used a few of those techniques today with our play money. 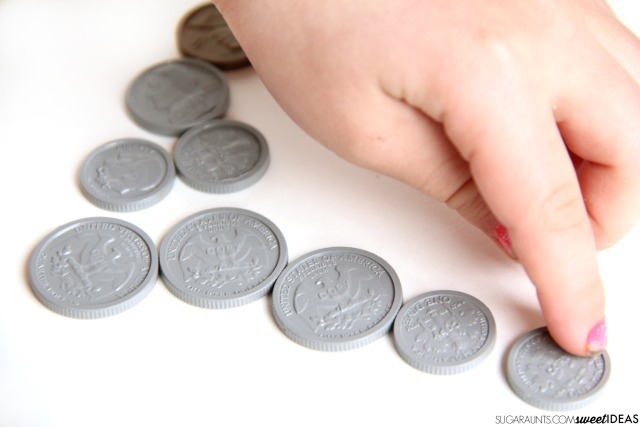 Stack the coins for a pincer grasp and practice in precision as you and your child count out the coins.